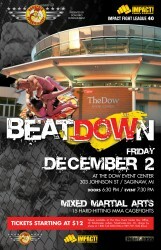 Donofrio MMA and the Impact Fight League made a triumphant return to the Dow Event Center in Saginaw, Michigan with their newest offering to the MMA world, the BeatDOWn II. Fans and fighters alike came out in force to witness and be a part of this first-class event. All the warriors in attendance were treated like the champs they are, which is an earmark of Mr. Donofrio’s style. As the lights went down, the crowd lit up, and the familiar sound of Phil “The Voice” Davey‘s trademark “Are you ready for a BeatDOWn? !” signified the start of the event. In the opening fight of the night, George Simos and Michael Busenbark entered cheap jerseys wholesale the proving grounds to give the fans what they came to see. And they did, without hesitation. The battle consummated at exactly two minutes in the very first round, with Simos unleashing a series of strikes that left the referee with no choice but to call a halt to the action. Moving down through the night, it was a festival of flying fists as Kirk Moore and Ravindra Karmai hit the cage. One of those fists thrown by Moore found it’s mark at just under two minutes in the first round, ending the fight via SWEET knockout. The next fight was a battle of two VERY well-known and seasoned ammys, Johnathon Dutton and Kamron Snyder. Something had to give with two experienced fighters such as these, and it didn’t take long. Jonathon came out on top in this outing, cinching an impressive lernen: submission victory at exactly the halfway mark of the first round. Fight number nine was a exciting and well-matched battle between Ben Bryant and Abraham Perez. The way these two mixed it up through the entire fight was amazing, and the crowd agreed. At the end of cheap football jerseys it all, the judges awarded the victory to Bryant for all of his hard work. In the very next fight it was Cheap Jerseys another epic battle, this time involving Mike Martinez and Stafon Solgot. These guys put it down for all three rounds in spectacular fashion. At the conclusion of the battle, the judges were left once again to determine who would emerge victorious. The judges awarded the decision victory to Martinez over a very game opponent. In the final bout of the night, Jake May and Austin Delargey put on a great display to close out the event. The fight was INTENSE throughout round one. Round two was equally as intense, but with only THREE SECONDS left in the round, Jake May finished the fight with an excellent submission. As always, a HUGE shout goes out to every warrior that made this event what it was – a SUCCESS! Without you…there’s no sport. Winner: George Simos at 2:00 in round 1 by TKO. Winner: Alexander Sarver at 2:21 in round 1 by TKO. Winner: Kirk Moore at 1:49 in round 1 by knock out. Winner: Johnathon Dutton at 1:30 in round 1 by tap out. Winner: Otis Caldwell at 48 seconds in round 1 by submission. Winner: James Allen at 1:20 in round 1 by tap out. Winner: Matt Grecheski at 56 seconds in round 1 by tap out. Winner: Justin Brandel at 28 seconds in round 1 by tap out. Winner: Ben Bryant by decision. Winner: Mike Martinez by decision. Winner: Isaac Bubinski at 2:19 in round 1 by TKO. Winner: Jake May at 2:57 in round 2 by tap out. Tagged Aaron Fultz, Abraham Perez, Alex Fisher, Alexander Sarver, Alric Jones, Austin Delargey, Ben Bryant, Big Ox, Fight Boss, George Simos, IFL, Impact Fight League, Isaac Bubinski, Jake May, James Allen, Joe Battaglia, Joe Donofrio, Joey "The Don" Battaglia, Johnathon Dutton, Joseph Battaglia, Joseph Donofrio, Justin Brandel, Kamron Snyder, Kirk Moore, Matt Grecheski, Michael Busenbark, Mike Martinez, Oscar Brown, Otis Caldwell, Phil "The Voice" Davey, Phil Davey, Ravindra Karmai, Roman Kaat, Stefon Solgot, Stephanie Battaglia, Travis Skinner, Zack Spanke. Bookmark the permalink.